Pixelmator has been updated for Mac to include support for the new HEIF image standard in macOS High Sierra. 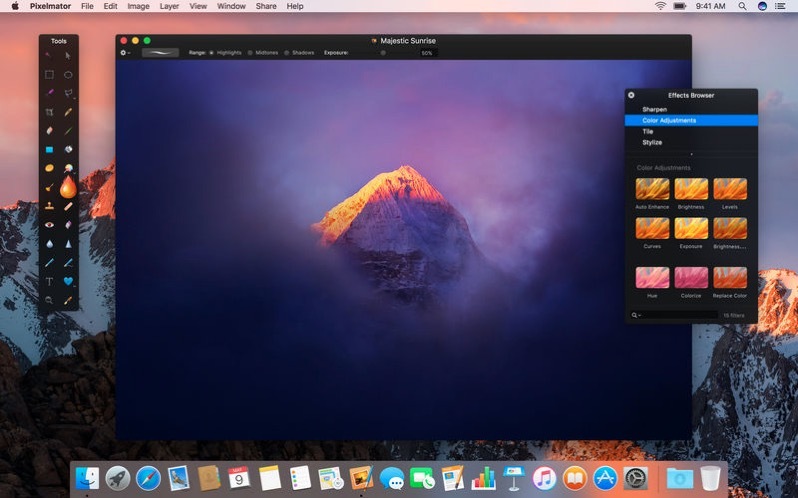 Once users have updated to Pixelmator 3.7, they'll also be able to make full use of the new Photo app integration available in Apple's latest desktop operating system. In macOS High Sierra, it's possible to open a photo in a third-party app right from within the Photos Library using the "Edit With..." menu option, after which Pixelmator should appear following the update. Subsequently, any edits made within Pixelmator will be automatically saved back to the Photos library. Added support for the new HEIF image standard includes the ability to import photos from iPhone 7, iPhone 8, and iPhone X, which save in the more efficient compression format by default. You can find out more about HEIF here. Other improvements in the 3.7 update to Pixelmator include enhanced support for Photoshop PSD files, an improved Repair Tool, and a return of the ability to drag image assets from Photos and Safari directly into Pixelmator. Pixelmator is available to buy on the Mac App Store for $30. Wow, where can I get that picture they are working on for my wallpaper! And on topic, I'm really happy the Pixelmator team is still going strong. It is great to have such a nice, Apple-focused, non-subscription based app available. Pixelmator has kept me from paying Adobe $9.99 a month for the last 3 years. Thanks team! I only need image editing half an hour a month at most and would gladly pay an upgrade to Pixelmator 4 when it comes out to support this team and their hard work. I own a copy of Lightroom non-subscription and use that every day. Oh jeez. Pixelmator pro is coming? I've just recently thrown my hat in with Affinity Photo after decades of Adobe stuff. If pixelmator pro's getting a similar featureset I'm going to be spoilt for choice. Saying that I doubt Pixelmator's iPad version is as feature complete as Affinity's? One thing I LOVE about Af:P is how its so easy to move a working file between iPad and desktop without compromises. Wonderful news. Pixelmator is a fantastic app. Pricing and a release date for Pixelmator Pro remain unknown, but the company confirms Pixelmator will continue to be maintained after Pixelmator Pro ships. Just curious, if you only need image editing half an hour a month, what are you using Lightroom for everyday? The stronger the Pixelmator and Affinity teams get, the less consumers and professionals a-like have to deal with Adobe's BS. I have used it to create stuff my for hobbies, clubs, and school projects. For my basic needs, I've definitely gotten my money's worth. Lightroom is primarily a cataloging and library software - very different to Photoshop. Photographers often only need global adjustments, filters and spot healing tools. Photoshop is much more than that. I totally understand that, professional photographer myself. That was my guess, I just wanted a bit of clarity.